Sir Christopher Wren is famous as the greatest of English architects. His most acclaimed work, the new Saint Paul’s Catherdrall, is one of the world’s most striking architectural monuments. He was a self-taught architect; yet shortly after he built the chapel of Pembroke College, Cambridge, and the Sheldonian Theatre at Oxford, King Charles II called upon him to redesign the city of London. Later, the king put him in charge of all of Great Britain’s royal and government buildings. If he had been nothing but an architect, Wren’s place in history would be eminently secure. He was in fact a good deal more. 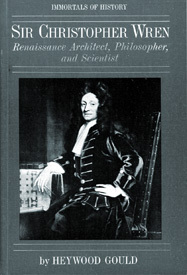 An artist, philosopher, and scientist, Wren characterized the renaissance ideal – a man of brilliant achievement in many diverse fields. He made significant discoveries in geometry, astronomy, anatomy, navigation, and physics, and helped guide the seventeenth-century world into the modern scientific age. In an era of great minds Sir Christopher Wren ranked among the greatest.